“The quality of the visitors attending Cancun is very high,” commented many of the 86 exhibitors at the second RT Imaging Expo in Cancun. The 2,000 sqm expo attracted 1,578 buyers of imaging products over 2 days. In terms of unique participants, where each person is only recorded once, 1,258 buyers and sellers came from 23 countries. These included the USA, Canada, Mexico, Peru, Colombia, Venezuela, Argentina, Ecuador, Chile and Brazil, and as far away as China, Germany and Malaysia. The Summit theme on “Industry Disruption” attracted a solid audience as well, as speakers from China, UK, USA and Mexico provided market trends and legal updates that will impact business in 2018. Patent attorney Ed O’Connor was applauded for his role over 10 years to see a victory for the Aftermarket in the US Supreme Court last month. He shared insights of that journey which sees US based OEMs rewarded for their inventions and patent rights at the time of the first sale only anywhere in the world. Managed Print Services (MPS) has not grown significantly and has worked much better for the OEM than Aftermarket suppliers. Industry advocate Tricia Judge reported the sale of counterfeit OEM supplies costs the industry US$3 billion in lost legitimate sales, or 3.5% of the entire marketplace. She said patent infringing compatibles, or new built clones were being sold as remanufactured cartridges while some have been made to look like a new OEM. 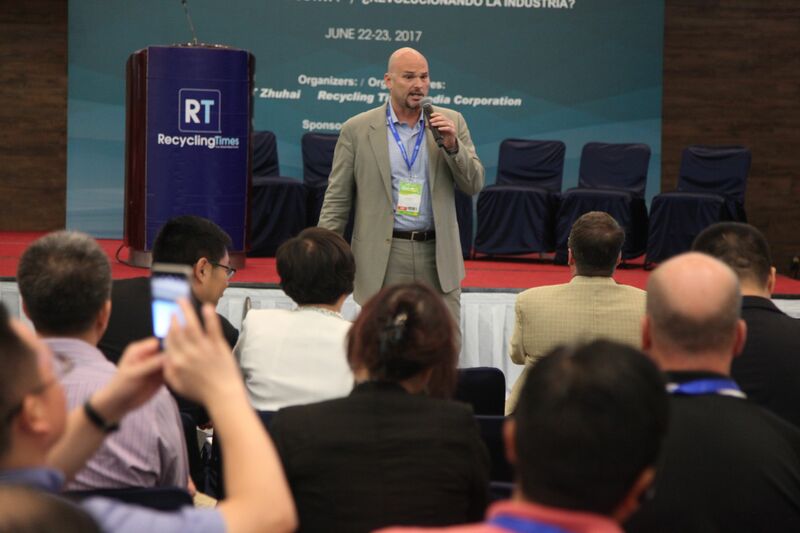 She reported that for Mexico, Canada, China the sale of remanufactured cartridges are welcome in the USA. Judge also shared a United Nations report revealing the top three E-waste generators of the Americas being USA, Brazil and Mexico. Conversely, the top three dumping grounds are Mexico, Venezuela and Paraguay. John Shane from market trends research firm KeyPoint Intelligence (formerly InfoTrends) revealed more than half of the population still prefer to view or edit material on hard copy prints and one-third of respondents simply find paper print outs to be more convenient. There was no difference between 18 year-olds and 50 year-olds. He also reported that almost 60% of users experience problems when shopping for toners online. UK-based Martin Wilde (pictured left) has been studying office products (OP) markets for some time. He claims 68% of his respondents saw a market decline in 2016, and 69% expect a further decline in 2017, particularly in paper and printer supplies. More importantly, dealers in the USA are undergoing huge disruption from online traders such as Amazon which has increased 7%. “Staples and OfficeDepot/Max which have declined 7% and 27% respectively, are in retreat. Amazon and other online resellers are widely reported as key growth channels and is forecast to be the OP dealers’ main competitor in future.” He sees the current and future battleground for OP is, and will be, online. He says the reasons to buy online are because it is easier, cheaper, quicker and there is often a wider product range. Mary Ouyang, recent awarded Entrepreneur of the Year in China says the country is succeeding in disrupting other markets because of four core competencies: raw materials, innovation, policy support and industry capacity. Luke Goldberg , the Senior VP in Marketing at Clover (pictured left), spoke passionately against the disruptive, new built cartridges (NBCs) that are destroying the Aftermarket through poor quality, infringing and reckless pricing. “Historically, NBCs have not taken share from OEM, they have shifted share from remans to NBCs.” He said NBCs lead to the destruction of reman markets, are low in quality, infringe the IP of the OEMs, and have low green credentials compared with the remanufacturing market. “Starting with the OEM core is critical to maintain OEM design, tolerances, and functionality, making remanufactured toners the clear choice versus NBCs.” He also warned that the OEMs, particularly Canon and Brother, are filing more patents on toner cartridges than ever. Prizes of Apple Watches, iPads and round trip air flights were well received, as was the free food each day and the gala dinner at Senor Frog’s. RT Media ran a similar event successfully in Cairo, Egypt in April this year, but its largest imaging supplies, office products and e-Commerce show in the world will open its doors in Zhuhai, China on October 12-14 this year. Solicita gratis 5 propuestas para tu agencia de comunicación o contacta con nosotros para más información.